Choosing a hose for your garden can be a notoriously difficult task. A lot of hoses are heavy, cumbersome and a pain to even think about dragging around your garden all of the time. Luckily, a lot of mainstream manufacturers have noticed this immense flaw and begun to design and manufacture lightweight alternatives to those stereotypical hoses that we all fear. One of the main things that you have to consider if you are looking for a lightweight alternative is whether or not any durability has been sacrificed in order for it to be lightweight. Durability is a key thing that you cannot simply leave behind and forget about because it is an integral component of gardening. Today we are going to be looking for the best lightweight garden hose to see whether or not any durable options are available. As we have already mentioned, choosing the right lightweight garden hose can be a difficult task. The reason for this is because it depends on what your needs are as a gardener. Lightweight hoses are not supposed to last as long as heavy-duty rubber hoses and reinforced vinyl hoses do, but they can still last for quite a long time. You do need to be aware of the fact that lightweight materials do not hold up to extreme temperatures in the same way that traditional materials do. If you know that your hose is going to be exposed to extreme temperatures, you should think about purchasing a traditional alternative and look into buying a housing unit that will stop it from being so cumbersome. It is safe to say that there is a large market of people who are looking for lightweight alternatives, and this has led to a lot of competition among manufacturers. This is a good thing because it has led to fittings being made more durable and unique materials appearing, like polymer combinations. You can still get lightweight hoses in different diameter sizes and lengths, but the types of hoses that are available are a little bit different. For example, a lot of lightweight hoses are made out of things like vinyl cores, polymers and thermoplastic elastomers. Thermoplastic elastomers are made by mixing plastic, rubber and polypropylene. This mixture is unique because it provides both flexibility and strength. Polymers are usually used because of their tolerance to high temperatures, whereas vinyl cores are usually used to maintain a kink free hose when it is filled with water. The type of material that you should be looking for depends on your needs as a consumer. Remember that not all materials are capable of holding up to extreme temperatures and you shouldn’t keep your hose pipe in an area where it could potentially get run over by a car. This could cause a lot of problems, depending on the material that your hose pipe is made out of. What are the Advantages of Owning a Lightweight Garden Hose? Owning a lightweight garden hose is a fantastic option for anyone who wants to make their gardening jobs lighter. Some lightweight hoses are completely collapsible, meaning that they expand as soon as they have been filled with water. This means that they can be easily pulled from one location to another before the water is turned on. One thing that we have noticed is that lightweight garden hoses are a fantastic option for senior people, those who simply cannot lift standard hoses and people whose strength has been limited by either an injury or an ailment. Owning a heavy hose can be quite the hindrance and it can make doing the gardening more of a chore than an enjoyable task, something that we believe gardening should never be. As a gardener, it is your responsibility to decide whether or not aesthetic appeal is important to you. If it is not important to you, then you can simply skip through this section. If it is important to you, then you should keep reading. Finding an aesthetically pleasing hose can be difficult, but there are some really nice options out there. If you like for everything in your garden to look natural, then you should try to choose a hose pipe that blends in perfectly with your current garden decor. This could mean something along the lines of choosing a green hose pipe because it looks nice against your grass. If you like for things to stand out, then you should think about choosing a hose pipe that has a fun color or a color that you really like. 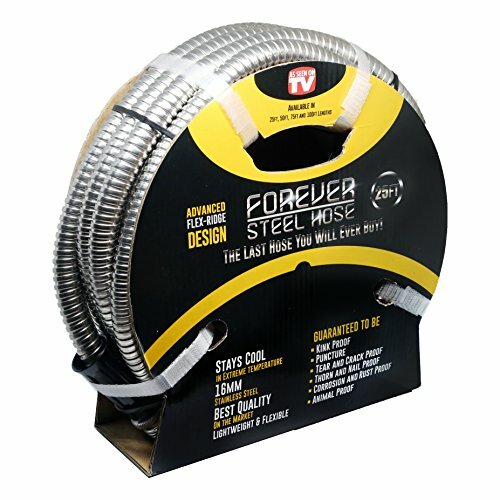 The Forever Steel Hose is an incredibly popular lightweight garden hose that claims to withstand the test of time. As gardeners, we all know just how important that test can be. It is actually a lightweight, metal garden hose that has been covered in a type of stainless steel that is both durable and flexible. This durability is important because a lot of lightweight hoses really lack durability. The stainless steel itself is kink-free, rust proof, corrosion proof and UV resistant. 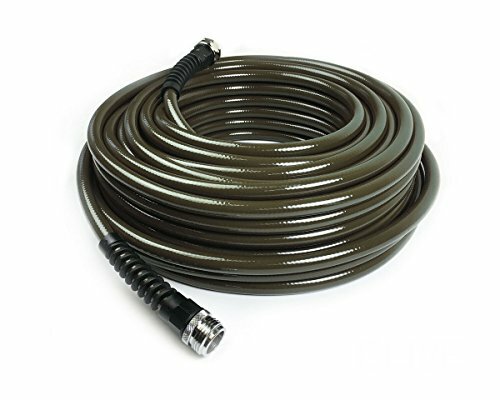 You could potentially connect two of these 50-ft. hoses to make a single 100-ft. hose, meaning that this hose pipe is still a good option if you have a large garden or area that you have to cover. The lining material inside of the hose is PVC, meaning that it is not weighed down. This garden hose is incredibly lightweight, weighing in at just 5 lbs. This makes it incredibly easy to carry around. It is also incredibly flexible, meaning that it can be turned, twisted and crimped without any lasting damage being caused. If you are looking to purchase a single hose, and not two hoses to connect, then this hose could end up being much smaller than what you need. 50 ft. sounds like a lot, but it is quite short in terms of hoses. This hose has quite a small internal diameter, meaning that it can only deal with a limited amount of water pressure. It would be suitable for use in a low volume irrigation system. The Wonder Home Gardens Expandable Hose is a rather unique product because it starts off at just 17 ft. in length, but it expands to 3x longer than this as soon as it is exposed to water. This leads to it becoming a 50-ft. hose. At just 17 ft., this product can be easily stored away. The hose itself has been made out of a latex material that is capable of handling a pretty average water pressure. 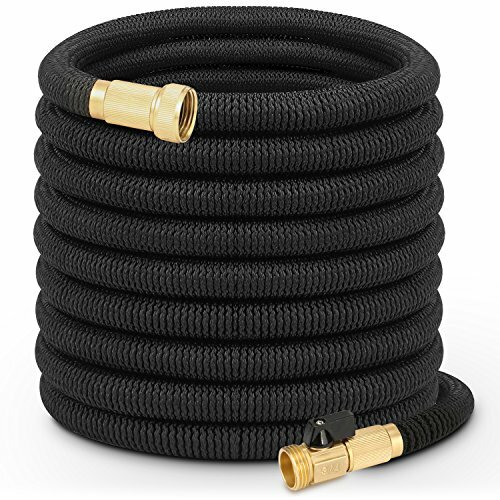 It has solid brass fittings and it is quite durable, especially when it is compared to other lightweight garden hoses. If you are looking for a portable garden hose, then this product could be the right option for you. It has the ability to make all of your watering jobs easier and it comes with a ribbed inner core, making it extra strong. It can be easily connected to any standard hose nozzle or garden hose and it weighs in at less than 2.5 lbs. This product is a super lightweight option and it would be suitable for almost anyone to use. Given that it weighs in at less than 2.5 lbs., you wouldn’t have any problems moving it around. It is worth remembering that this hose is capable of shrinking, meaning that it will look much smaller than it actually is when it first arrives. This hose comes with a nozzle than has 10 different water settings. These can be used for everything from misting your garden to jet washing your car. This means that you won’t have to worry about buying a nozzle separately if you do not already own one. This is a wonderful product, but it could be quite easy to lose it in your garden. It is green in color and it could potentially cause an accident if someone were to fail to notice it beneath their feet. The growfast Garden Hose is similar to the Wonder Hose Gardens Expandable Hose in that it grows as soon as it is exposed to water pressure. It starts off life at 33 ft., but it can reach a whopping 100 ft. when it is in use. This particular model is great because it comes with all of the necessary features that you should be looking for if you are a gardener, it also has the solid brass fitting connectors that you need. This strong and efficient hose can be used in all types of weather because it is still incredibly durable. The lightweight nature of this product is beneficial because it is also flexible and incredibly unlikely to kink when moved. The pipe retracts back to a normal size as soon as the water pressure is turned off. This garden hose is lightweight and durable; given that it has been made out of a form of double latex. It is unlikely to crack under long sunlight conditions, but we would always recommend storing your garden hose away from the sun. Unfortunately, this product comes with a plastic bag for carrying it. This is quite a disappointment because you can’t really store a hose away safely in a plastic bag. It does not come with any connectors and the ways in which you can expand this hose are restricted, but it is much longer than other lightweight alternatives anyway. 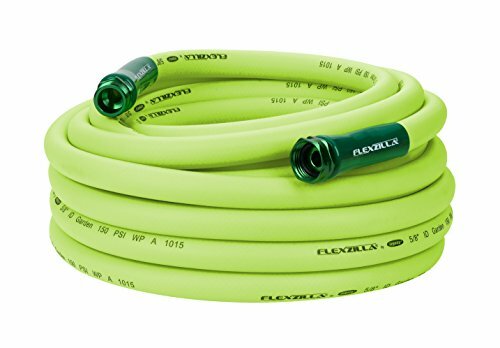 The Flexzilla Garden Hose is slightly heavier than some of the other options that are available on this list, weighing in at approximately 9 lbs. It features a rubber design that is soft, pliable and unlikely to get caught up in any traditional coil patterns. This can make it quite difficult to unwind, but it is smooth to wind up. Winding up is the area that most people find difficult. This hose is approximately 50 ft. in length and it features aircraft quality anodized aluminum couplings. These are important because they will not rust or begin to show wear when exposed to adverse weather conditions. One of the best things about the Flexzilla Garden Hose is the fact that it can handle a good water pressure amount. This means that it is capable of taking on tougher jobs without breaking. This hose is unique because it comes with a limited-lifetime warranty. This shows us that the manufacturers believe that they can create hoses that are both high-quality and lightweight, whereas a lot of manufacturers have to lean more to one side of that than the other. The Flexzilla Garden Hose is known to get moldy over time if it is not properly cared for. It could also potentially lose some of its bright green color due to exposure to the elements and different temperatures. The Water Right Garden Hose is one of the most expensive products on this list, but it has enough features to justify what it costs. For example, it can hold water pressure of up to 400 psi. It has also been certified by both the NSF and the NDA as perfectly safe to drink from, meaning that none of the materials include lead and they are all BPA-free. The fittings on this garden hose are made out of brass. The hose itself is durable and it has been built to last. It comes in a green color, but different color options are available, meaning that you can choose one that you find aesthetically pleasing. You do have to pay a premium if you would like to be able to drink water safely from a hose. In our opinion, it is worth the additional cost to make sure that the water coming out of your hose is safe to drink. This hose is an incredibly lightweight option as it weighs 3 lbs. This means that you will never have to struggle to carry around and it is easy to store. We love the fact that this hose comes in a variety of different colors. 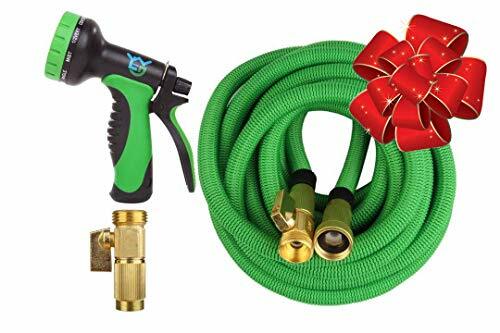 Most hoses come in a single color, giving you no room to choose the way in which a hose looks, but you could potentially choose a hose that matches the color scheme in your garden with this product. If you do not want to purchase a hose that is safe to drink from, then other options that are more affordable are available. The INAYAHOSE Expandable Garden Hose has two different layers. The outer side of this hose is made of a woven fabric material, while the inside of this hose is made out of a multi-layer latex core. All the fittings in this hose are made out of brass so you do not have to worry about them breaking. This is an expandable hose, meaning that it can reach approximately 50 ft. when water pressure is flowing through it. This model does not kink or get tangled and it is both light and flexible, making it easy to carry and move around. Owning an expandable hose is useful because they can save time and space. This lightweight product comes with a 1-year replacement guarantee. These guarantees are quite useful when it comes to lightweight hoses because they aren’t designed to last for long periods of time. Expandable hoses are useful because they can be stored away in small places. This hose is also functional because it comes with a spray nozzle that has 9 different settings. You could use this nozzle to spray grime off of windows or wash your pets, as long as you have it on the right setting. One of the only downsides that this product has is the fact that it is quite short. You cannot simply connect it to other hoses in an effort to make it longer. If you have to cover a large area, then this hose might not be long enough for you. 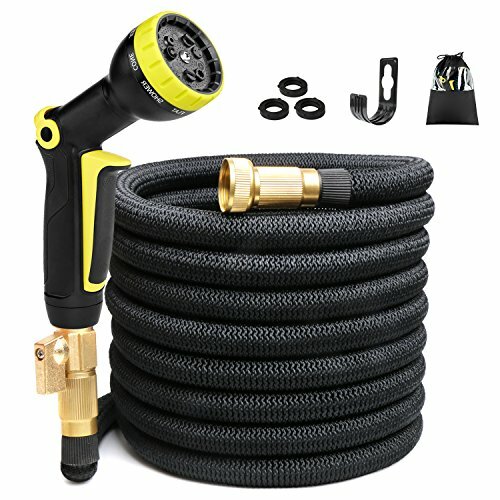 The Wonder Home Gardens Expandable Hose is one of our favorite lightweight hoses. You should not have to spend more to have a hose that is lightweight, but you should be able to expect your lightweight hose to be just as durable as a standard hose would be, even if you know that it will not last as long. Competition has been a wonderful thing in the field of lightweight hoses. It has led to their quality improving and better fittings and materials being used. As a consumer, it is your responsibility to decide what sort of functionality you need. Make sure that you choose a product that suits your needs and do not settle for anything less.